Traffic roundabouts are here, but they have some residents going in circles. One of my early newspaper assignments was to stand on a median on McCart Avenue in south Fort Worth and note the number of motorists who wore seatbelts. Cars whizzed by, whipping wind into my face. I hunkered down and counted seat belts for hours. Texans were pissed off. This was 1985, and a new law demanded motorists buckle up or be ticketed. The outcry was fierce here in pickup country. Real men didn’t wear seatbelts. Cars and trucks weren’t yet buzzing or beeping if you didn’t buckle up; many drivers didn’t bother. As an un-seat-belted teenager, I once sped down a country road in the fog and flipped and totaled my truck but didn’t get a single scratch or bruise. That proved to me that seatbelts were unnecessary. Yet there I was a few years later, a cub reporter trying to remain neutral and avoid all bias as I researched the new law … a law that was obviously a crock. Who in the hell had the right to tell me to wear a seatbelt? The answer, of course, was the Texas Legislature. The insurance industry used statistics to convince lawmakers that seatbelts were in the public interest. Safety records proved that, although a drunken kid without a seatbelt might occasionally roll his truck and remain fresh as a daisy, more often than not the kid flies out a window and cracks his skull. The “Buckle Up, Texas” and “Click It or Ticket” marketing campaigns — along with the advent of $200 tickets — convinced Texas drivers over the years that wearing a seatbelt isn’t a big deal. And as it turned out, the belts indeed have saved thousands of lives. 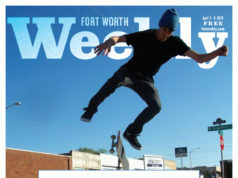 A few weeks ago, a grayer and paunchier journalist stood beside another Fort Worth roadway, again deep in research. He endured 60-degree weather and a slight breeze while observing motorists trying to maneuver their way through the new traffic circles on Elizabeth Boulevard in the historic Ryan Place neighborhood. The city built three roundabouts a couple of months ago, and the traffic “calming” devices are provoking some decidedly un-calm reactions. 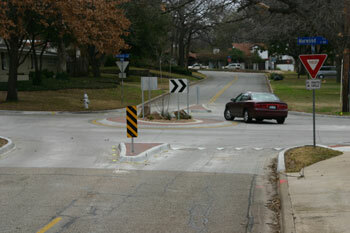 Modern roundabouts are smaller than old-school predecessors such as the Benbrook and Bluebonnet traffic circles. They typically consist of a decorative obstruction in the middle of an intersection, often with plantings. 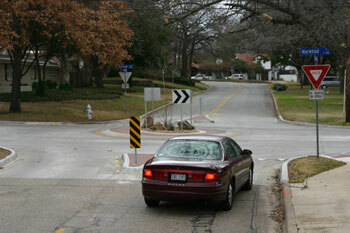 The circles replace stop signs with yield signs and feed traffic counterclockwise around the intersection. Neighborhood roundabouts are popular in other areas of the country, where residents grow accustomed to them and even embrace them in time. Fort Worth isn’t there yet. An elderly woman driving east on Elizabeth Boulevard the other day came to a sudden stop. The roundabout at the Willing Avenue intersection sports a flurry of street signs, but none of them says “STOP.” Still, she sat, staring through her windshield, mouth open wide, fists clenched on the steering wheel, ogling the traffic circle as if it were a paisley-print spaceship just touched down from Mars. After a few seconds, she slowly drove around the obstacle. The next driver to come along barely hit his brakes as he zipped through like a NASCAR pro. The look on his face indicated he was unhappy at having this odd structure plopped in his path to try to slow him down. He sped up instead. Other motorists displayed similar confusion or displeasure. Residents living nearby — the ones most likely to benefit from reduced speeds and safer roadways — aren’t all on board either. “It seems like a waste of money,” said a woman walking her dog along Elizabeth Boulevard. She asked to remain anonymous, saying she was new to the neighborhood and didn’t wish to upset anyone. Discussions about traffic circles can become volatile in a hurry. In the past, stop signs controlled traffic at the three Ryan Place intersections. But east-west Elizabeth Boulevard is straight and wide, and motorists use it as a connector to cut across town. Some rolled through — or ignored — the stop signs, making residents, bikers, and walkers feel unsafe. Now some of them feel angry. Yikes. What next? Occupy Roundabout? Protesters waxing nostalgic for the simple days of stop signs and speed bumps? Don’t count on it. Traffic circles are trending, baby. The insurance industry that steered the country toward seat belt usage a quarter- century ago provides a weighty voice these days on the traffic circle debate. They come armed again with statistics. “From a safety perspective, round-abouts are an enormous improvement over [traditional] intersections,” said Russ Rader, spokesman for the Insurance Institute for Highway Safety. 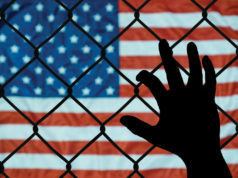 The private nonprofit group is funded by auto insurance companies. Accidents at roundabouts are more likely to involve low-speed side-swipes and fender-benders. Cars are able to roll through, which reduces the amount of time spent waiting at red lights or stop signs. This reduces fuel consumption and emissions. The advent of small traffic circles in residential areas has occurred mostly in the past 20 years. About 1,500 have been built nationwide since 1990 — with auto insurers serving as enthusiastic cheerleaders. The trend is getting attention at city halls. 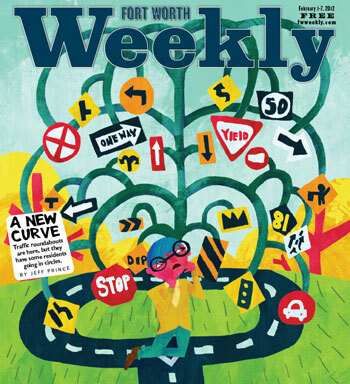 “There is a growing cadre of traffic engineers around the country who have really championed roundabouts in their own communities after the research showed such big benefits,” Rader said. You’ll get little argument from top traffic engineers in Fort Worth, Arlington, Colleyville, Southlake, and other cities that are dipping their toes in the roundabout pool. The Metroplex is “way behind the curve on building stuff like this,” said Arlington Public Works Director Keith Melton. Melton recently oversaw construction of a roundabout on Norwood Lane, a wide, straight street through a central-city neighborhood that has battled a speeding problem for decades. Norwood was a popular drag racing spot in the 1970s, and even after both sides of the street blossomed with houses, the high speeds continued. A recent traffic survey showed people driving double the 35-mph speed limit and with an average speed of about 50 mph. Residents were afraid to back out of their driveways or allow their kids to ride bikes on the street. Stop signs don’t do much to slow down traffic without constant police monitoring. Speed bumps aren’t allowed on four-lane streets in Arlington, and besides, they aren’t considered safe on roads where motorists regularly exceed 30 mph. Two years of studies, homeowner meetings, and surveys prompted the city to build the roundabout, reduce the street from four lanes to two, and add bike lanes on either side. Complaints were immediate, even from some residents who originally supported the idea. Too many signs, too expensive, too ugly, people grumbled. That could eventually change. Cities elsewhere reduce the number of signs as motorists became more familiar with the roundabouts. Melton reminds people that the roundabouts are working. Motorists are slowing down. And while the city spent $88,000 to design and install the traffic circle, signage, landscaping, pavement striping, and curbs to separate bike lanes from car traffic, other options could have cost more. Installing traffic signals would have cost more than $100,000 plus maintenance, he said. Roundabouts are often landscaped, but typically with drought-resistant plants. Neighborhood volunteers do the weeding and watering. Arlington will build two more traffic circles in South Arlington — one on Calendar Road and another on Russell Road — as part of a capital improvement project in 2014. Some neighbors, particularly those with children, appreciate the safety factor. Cars are definitely slowing down. 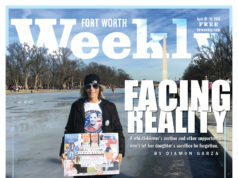 But Fort Worth Weekly’s unscientific survey of Norwood residents — walking door to door and ringing doorbells — showed that many are tolerant at best and dissatisfied at worst. A woman who lives directly adjacent to the traffic circle tried to be positive. “It’s definitely slowed down traffic, but I don’t think people are used to those things,” she said, declining to give her name. “I don’t think people perceived how it would all come together,” she said. However, a couple who live across the street with two young children are thrilled, Stratton said. Norwood Street resident Bill Loflin appreciated the city’s interest in slowing traffic. But now he sees a slew of street signs and considers Norwood the city’s ugliest street. “We needed to do something, but not like this,” he said, citing the high cost as another concern. 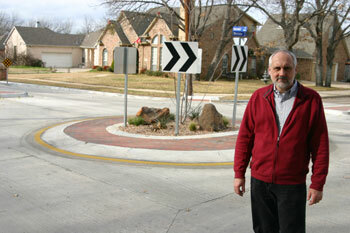 Barry Johnson said the roundabout is ineffective, dangerous, and ugly. He has an engineering background. 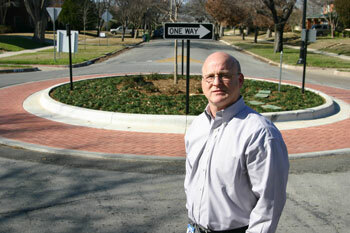 Local traffic planners expect opinions to change as motorists get the hang of roundabouts. That’s what has happened elsewhere. Seattle has installed more than 1,000 of them in the past 25 years. Reduced speeds and fewer accidents have swayed public opinion, and now Seattle neighborhoods are clamoring for traffic circles. The city currently builds about a dozen a year. “We get far more requests for them than we can fund,” Seattle Department of Transportation spokeswoman Marybeth Turner said. circles with reducing accident rates. Even some local drivers have taken to the roundabouts with ease. A long flatbed truck carrying landscaping equipment approached the Elizabeth and Willing intersection on a recent afternoon and easily made the most difficult maneuver of all — a left turn, which requires veering right and driving almost completely around the snug circle. “It slowed him down, but he was able to maneuver it,” said Ryan Place Neighborhood Association president John Kline, who stood nearby watching. At least for now, however, naysayers appear to outnumber supporters. Kline said he hadn’t heard a large number of complaints but realizes opinions are mixed. The $186,000 spent on Elizabeth Street roundabouts came from a 2004 capital improvement fund designed for intersection improvements. That fund is now used up. 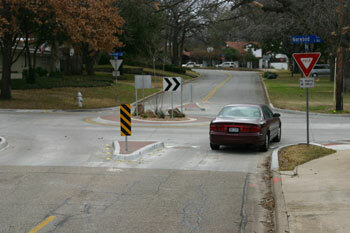 Still, you can expect more roundabouts in Fort Worth in the future. Henderson Street is getting one as part of the Trinity River Vision project, and developers of new subdivisions are showing more interest. The developer of a subdivision in South Fort Worth is planning to build one later this spring at Summer Creek Drive and McPherson Boulevard, Fort Worth Transportation and Public Works director Douglas Wiersig said.